In a recent post, I talked about a rather obvious but for some reason, little-known theme in western art and music, which is; everyone has a connection to a higher source of inspiration. On the other side of the coin, as it were, we have the views of people like Plato, who I have compared to Hitler in other posts, since he was for the control of artistic expression to serve the good of the state. Now, all arguments about the definition of God aside, what’s the point of having inspiration if it doesn’t go beyond ordinary thinking? So we’re saying this Source or Inspiration is something that can’t be reached too well with normal thinking. Here we also get into the idea that normal thought processes can be conditioned and influenced by outside sources. And isn’t this what folks like Plato and Hitler are seeking to do anyway? Control and monitor the thoughts of the group. It is in these circumstances that music or artistic expression in its purest form can be powerful in undoing this kind of conditioning. Interesting that in this ‘Age of Reason,’ you don’t hear about inspiration much. But I submit that reason is a good mistress but a bad master and music serves no master. One frequently runs into folks with the idea that music should serve some political end, be they well meaning or not, but this only serves to drag the creative process down closer to Earth, as it were. It grounds the creative process until it is in danger of functioning like a Rube Goldberg machine. Except that, unlike Rube Goldberg machines that eventually did something, reason that is aberrated by conditioning or bypasses installed by society, circulates around and around in a pretzel logic fashion, arriving at the same foregone conclusions every time. "The introduction of novel fashions in music is a thing to beware of as endangering the whole fabric of society, whose most important conventions are unsettled by any revolutions in that quarter." It brings to mind Nazi Germany where the state controlled the art and it was all about the Arian Race. Also brings to mind Russia, under Stalin, where the state ran the media and a bad review could get you sent to a concentration camp or executed. Dmitri Shostakovich was reputed to have slept downstairs with his bags packed so that, when the secret police came to get him, he wouldn’t wake up his family. Now all of these are societies that could have used a little unsettling of their most important conventions and I think that Plato, unwittingly, hit the nail on the head as far as the definitions of what art and music are. I daresay there has not been a society whose most important conventions did not need a little unsettling. Music and art are communication and they are nothing if they don’t cause people to come out of their conditioning and take a look at what is going on. When we used to study the blues, in school, they said it was a musical form innovated by the black slaves and was used to spread news. What news, we wondered? It was the news about the reality of their situation. The status quo, in time, becomes an enslaving trap. Music should challenge the status quo. Music and art that doesn’t do this is, as Paul Simon says, ‘the sound of silence.' And thanks to Plato for defining what music and art should be. It occurs to me that I need to take responsibility for the condition our culture is in. It’s not that there’s nothing good going on; it’s embarrassing for me to admit that there is quite a lot of stuff going on that I enjoy. Of course, I wouldn’t be who I am, if that wasn’t the case. One cannot live in the past and say that they are truly alive, and it is my nature to seek out things that I enjoy in the present time. It’s just that things have shifted, there can be no doubt of this, and what’s needed are sign posts put up to point the way so that things continue in the direction that was intended. As will be seen this movement is the finale; the movement to end all movements. Now obviously the OYES Movement is about thinking for yourself. Unfortunately, people seem ill prepared for such a task; sort of like some of the scenes out of The Life Of Brian, and all the people who became Minimalists after reading its political manifesto. People believe that they think for themselves but the average person gets his opinions from ‘Authorities’; The Church, The Media, The News, Critics and other Talking Heads and even Friends. This is actually quite a problem because none of these Sources is giving out the Straight Un-Biased Dope. To straighten The Way, the OYES Movement will have a User’s Manuel on Thinking For Yourself. It’s in the form of a Code or Manifesto and here is its first draft. My own opinions, as an individual are what really matter. I take responsibility for my opinions by doing my best to make sure that they are informed opinions. I am not necessarily satisfied with taking my information from the first ‘Authority’ that presents itself, but question this information and look ever deeper until I am satisfied I have the actual source of the information. The OYES Movement tends to view the obvious ‘Authorities;’ The Church, The Media, The News, Critics and other Talking Heads and even Friends as questionable at best. I know that, if I dig deep enough and arrive at the Relative Truth of something, then I am the only ‘Authority’ that matters. I will not be intimidated or thrown off by any ‘Authority’ once I am satisfied that my conviction is correct. In future post, we will take up how this applies to music and art, in general. I grew up loving classical music. As a young child, I found a recording of Beethoven’s Sixth Symphony and fell in love. My music appreciation, at that time, was strictly classical, for the most part. Sure, every now and then I would hear some song on the radio that caught my fancy and I distinctly remember sitting in our living room when The Beatles made their American television debut on the Ed Sullivan Show. You see, my parents always watched the Ed Sullivan Show and, suddenly, there were The Beatles and hundreds of screaming girls in the audience. I thought this was very strange; why would the girls be screaming? I looked back at my parents to get their take on it but there was dead silence. It was just as if someone had set a bomb off. I can still see the shocked expression on my mom’s face. Well pop music remained just sort of a fascination and, as I studied my classical music, I grew more convinced that it was just a lower, debased form of music. Then I went to the Peabody Music Conservatory in Baltimore. Here was a very conservative musical institution that held the line on music teaching at the end of the eighteen hundreds. This was strictly classical and the composition teacher was famous for saying that jazz wouldn’t last. He had not stepped out for some decades, evidently, because there was jazz in every club in Baltimore. I don’t know if it was in reaction to the extreme conservativeness of that environment or what, exactly, but my peers and myself decided we were definitely not conservative anymore. There was a lot of experimenting with altered states of mind, sexual activities and things of that nature. We were innovating, really, although we didn’t know it. We decided that good music was good music no matter where or when you found it. We started an extracurricular activity called Music Appreciation, where students from all around would bring their favorite music and it would be played. These sessions went on for hours with no conversation whatever; only dead silence and rapt attention to whatever music was on. The program ranged from jazz to pop to classical. After it was over, people would just move off and sort out their opinions on what they had heard or have a discussion amongst their selves. And it was in Music Appreciation that I learned there are more similarities than differences in different musical genres even if there are centuries separating them. That music that you like, that all your friends say is un-cool, you need to start listening to it and screw what your friends think. It’s not taboo to like more than one genre in music. In fact, you can like as many different genres as you want. It’s not taboo to think that music from an older time period is cool. Every age had its new music and artists that shook up the status quo. Music is not meant to be just in the hands of ‘professionals.’ It’s not taboo to pick up an instrument and start to learn to play it. You can compare a lot of these taboos to the taboos that Moses’s followers had, coming out of Egypt. Sounds strange, right? But think about what Moses’s laws were trying to do; to separate those people from the people and culture of Egypt. Now, every new generation has had its own music and mainly to what end? To create an identity that is separate from the previous generation. Take a look; it’s been going on for longer than you might think. Now it’s no longer counter-culture but very much a tool of the establishment. The suits that are collecting the money are blessing all these taboos and taking it to the bank. Meanwhile, culture suffers and creative freedom goes down the drain. Break a taboo and get a free music download of Rhapsody in Black. If you work in a classified area of the government, being caught listening to new music will most certainly cause you to be reprogrammed and reassigned. If you are one of the guys who are in charge of ‘pushing the button,’ this most assuredly is true. The reason behind this is new music tends to deprogram the mind rather quickly; you might start to think life is worth living and no longer have any desire to push buttons. You might tell your boss to ‘take this job and shove it!’ This will usually get you fired pretty quickly. You might be caught smiling and dancing a lot and this will make your boss think you are on something. You might violate the dress code by growing your hair and wearing kaki safari suits to corporate meetings and saying things like ‘whatever,’ after the profit graphs are presented. You could get caught, covertly sabotaging the sound system in the office elevator. And there you have it; some of the risks involved with new music down through the ages. Be thankful that, in this day and age, you only get fired. Back in the dark ages, listening to new music could get you stoned or burned at the stake. From a true fan of all your music. These are but a few of the many fan letters that have been coming in, praising the new sounds of Dizzy O’Brian. 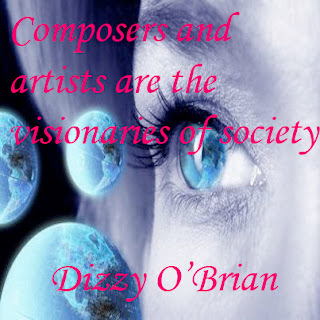 Find out why fans are saying what they do, after they listen to music by Dizzy O’Brian. Get a free mp3download of Rhapsody in Black when you join Dizzy’s Fan Mail. These videos offer a sampling from the three latest albums; Charm City, Tea with the Alien and 4 Good Measure. Dizzy O’Brian is a musical artist who works in a fusion of musical styles, freely melding pop and classical genres together. Charm City, the first album, is a collection of very pop oriented instrumental tracks that has attracted thousands of fans on the Internet. “Rhapsody in Black” is the most popular of these tracks. This is probably one of the most traditionally jazz oriented tracks, featuring Dizzy’s jazz piano stylings and jazz band. “A Dragon” is also very jazz-like, with jazz flute being featured but this one has a distinctly exotic and Latin feel. “Sailing” is a good-time tune, featuring rock guitar and saxophone, inspired by days of sailing on the Chesapeake Bay. ‘Charm City’ is, of course, a reference to Baltimore, where Dizzy spent his younger days in music school and playing in clubs. His experiences in Baltimore were unique as the city itself but also quite universal, so it can be up to the listener to discover how the musical trip relates to him or herself. “The Dimensional Badinage” is from the album Tea with the Alien, a very abstract collection of more orchestral sounding tracks but still mixing in modern elements of drums and electric guitars. “Kosmic Rain” is from the album 4 Good Measure which is a return to the more pop oriented sounds of Charm City created from the request for more of this from the fans. This album, however, is more pop rock oriented and features electric guitar much more. It uses the distinctive sound of a duo of electric guitars in a number of the tracks. “Kosmic Rain” is one of the more relaxed numbers from this album of mostly upbeat tracks, so enjoy these music videos. Get a free mp3 download of Rhapsody in Black when you join Dizzy’s Fan Mail. 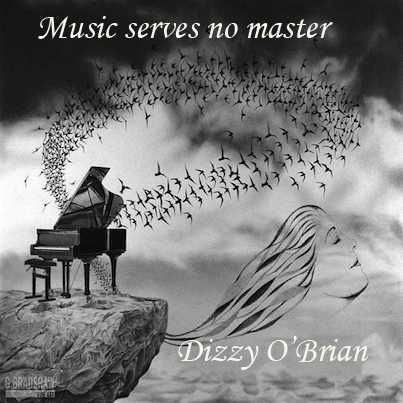 Sign-up for Dizzy’s Fan Mail and get a free mp3 song download of “Rhapsody in Black,” one of Dizzy O’Brian’s most popular instrumental tracks. It has received over a thousand likes on music sites. This track features jazz piano and band and is a very up-tempo tune. listen to music by Dizzy O’Brian. As a subscriber to Dizzy’s Fan Mail, priority previews of upcoming materials and free downloads. You will be the first to find out about all his musical activities with behind the scenes looks. · Charm City. This album contains Rhapsody in Black and many other pop/fusion instrumental tracks. Charm City refers, of course, to Baltimore, where Dizzy went to music school and played in the clubs there. There were many strange and curious times. One track, however, was written when Dizzy was a teenager. · Tea with the Alien. This is an album of very abstract and descriptive music, as the title suggests. Despite its very abstract quality, some of the tracks have been consistently been at the top of the charts different music sites. · 4 Good Measure. The new album release, which pushes the envelope on the pop/classical fusion style of Charm City. Released in response to the feedback on Charm City and the demand for more of the same. Fans have said the music is addicting and they listen to it over and over and recommend it to their friends. If you haven’t yet, you should listen to music by Dizzy O’Brian and you can start right here by getting a free mp3 download when you sign-up for Dizzy’s Fan Mail.